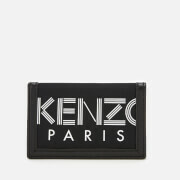 Men’s black leather coin purse from Parisian music and fashion label, Maison Kitsuné. Crafted from smooth leather, the card holder is designed with a zip around closure that opens to reveal a vibrant lined interior and a slip pocket. 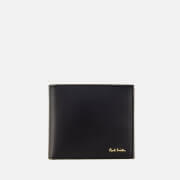 The front of the wallet features the brand’s signature debossed tricolour fox to one corner. Complete with gold-tone hardware and a branded gift box.